Canyonlands National Park is Utah’s largest national park and a popular place for whitewater rafting, mountain biking and backpacking. The Colorado River has carved deep canyons through the park. Island in the Sky: The area on top of a 1500 foot mesa with a scenic drive that has twenty miles of paved roads and pullouts with spectacular panoramic views of Canyon Country. This section of the park receives the most visitors. The Needles: A remote southeast section of the park with colorful spires of Cedar Mesa Sandstone. There are sixty miles of trails for overnight backpacking trips in this section of the park. The Squaw Flat Campground is in the area with 26 first come, first served campsites. The Maze District: The most remote part of the park is known for its dead-end canyons. Only 2,000 people per year pass through this area and most do so with a jeep. A high clearance four wheel drive vehicle is required on backcountry roads in this area, which presents considerable risk of damage. In 2008, Backpacker declared it America’s most dangerous hike. It borders Glen Canyon National Recreation Area. Horseshoe Canyon: Home to some of the most significant rock art in North America. The best known panel is the Great Gallery, which is reached by a seven mile roundtrip hike. Cataract Canyon: Cataract Canyon beings where the Green and Colorado Rivers meet. It is considered one of the best rafting trips in the country. The 14 miles of whitewater rapids on the Colorado River through Cataract Canyon contains numerous stretches of Class III-V rapids. White Rim Trail – A 100 mile loop on a jeep road that is a popular 3-5 day trip for mountain bikers. There are ten camping areas along the trail but no potable water so most bicyclists use a support vehicle with four-wheel drive. Evidence shows humans first visited Canyonlands about 10,000 years ago, when nomadic hunter-gatherers depended on wild plants and animals to survive. They appear to have traveled through the area, perhaps seasonally, not leaving many artifacts or structures. They did leave behind the rock art found on the cliff walls of Horseshoe Canyon. About two thousand years ago, domesticated animals and plants were the main food source. Ancestral Puebloans and Fremont people grew maize, beans, and squash, and kept domesticated dogs and turkeys. They lived year-round, in villages like the one preserved at Mesa Verde National Park. Growing populations at Mesa Verde led to searches for new land in the area, and large groups moved to the Needles District near Salt Creek. Structures remain, such as the one at Roadside Ruin in the Needles, or the Aztec Butte on the Island in the Sky. Changing weather patterns made agriculture increasingly difficult, and the ancestral Puebloans left the area for present-day New Mexico and Arizona. After they left, Ute, Paiute, and Navajo people moved in, and their decendants remain today. They were also hunter-gatherers, and did not extensively explore the Canyonlands area. Early European settlers included the Spanish Fathers Escalante and Dominguez, seeking California, as well as French and American trappers and traders, searching for beaver and otters. Official exploration began in 1869, when Maj. John Wesley Powell lead an expedition from Wyoming to the Grand Canyon, with an inspiring stop in what is now Canyonlands. In 1855, Mormons set up a mission in what is now Moab. Conflicts with the Utes led them to resettle in southeast Utah, where they became farmers, prospectors, or ranchers. The ranchers used the area of Canyonlands as a winter pasture. 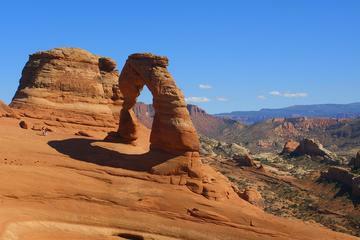 The area was advocated toward National Park status by the superintendent of Arches, and the park was established in 1964. An entrance fee of $15 for motorcycles and $25 for private, noncommercial vehicles is charged at entry. The passes are good for seven days. The park offers an annual pass for $50 that is good for 12 months from the purchase date, and also grants access to Arches National Park. The national park pass ($80), senior pass ($10) and other national park passes are accepted at Canyonlands National Park. There are about a dozen approved concessioners to guide you on a whitewater rafting trip through the park. 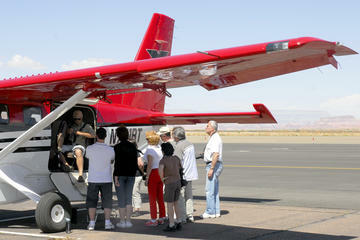 Offered trips range from one day to five or more days. Mesa Arch Trail – A popular .6 mile loop with spacious trailhead parking. 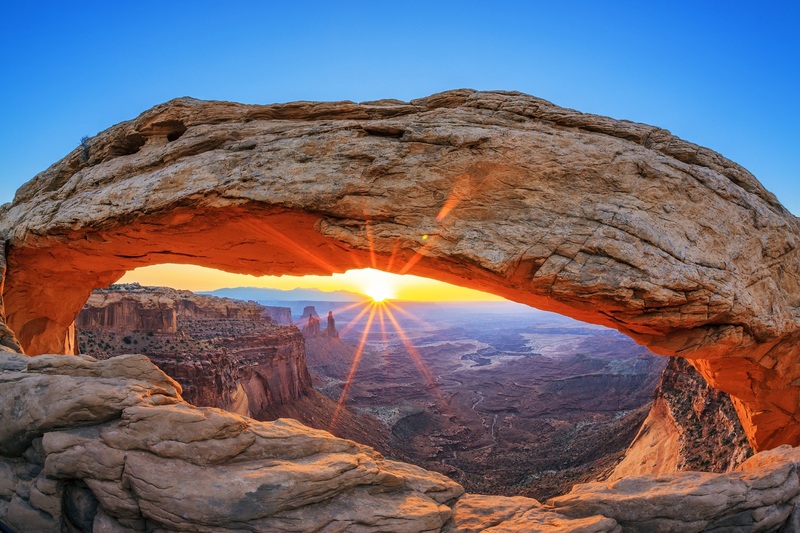 The arch faces east, so it is a popular place to photograph the sunrise. Upheaval Dome – A one mile roundtrip hiek to reach the first overlook of this geological attraction, and participate in the debate about whether it was formed by a meteor – or another manner. Catfish and carp are abundant in the Colorado and Green Rivers. Courtesy of the AstroViewer night sky map. 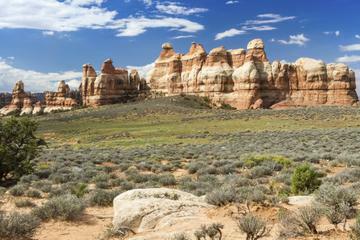 There are two campgrounds in the Canyonlands – one at The Needles and one at Island in the SKy. Willow Flat Campground has a dozen campsites in Island in the Sky. If you stay here, take the short walk to the Green River overlook at sunset. Squaw Flat Campground is in The Needles. Due to its remote location, the 26 campsites here fill up fast during the busy season. Backcountry camping requires a permit. Mountain bikers and four-wheel drivers must stay in designated campsites. Backpackers in The Needles must also stay in designated campsites. Backpackers in The Maze or Island in the Sky can choose their locaiton within at-large zones. Moab is a small town (population 5,000) along U.S. Route 191 just to the south of Arches National Park that contains a variety of hotels and motels. 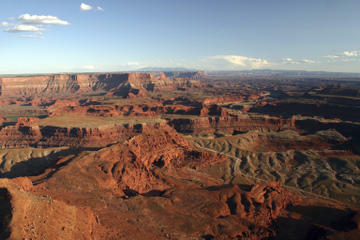 It is located about 30 minutes west of Canyonlands National Park.